While the video-centric features grab the headlines — and we’ve not touched the surface with its feature set — with its 20-Mpix MOS sensor and powerful processor, the GH5 has a lot to offer still shooters. The sensor offers a maximum 25,600 ISO and delivers stills at a rate of up to 12 fps (dropping to 9 fps with continuous AF). While the body is relatively large for this type of camera, measuring 5.5 x 3.9 x 3.4″ / 138.5 x 98.1 x 87.4 mm, it houses a 3.68M-dot OLED EVF and a 3.2-in 1.62M-dot articulating touchscreen LCD. The body is constructed from magnesium alloy and is splash-, dust-, and and freeze-proof to –14ºF (–25.5ºC). The GH5 is available now at around $1999. 12 fps continuous shooting (9 fps in continuous AF). 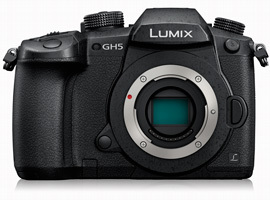 The Panasonic Lumix DC-GH5 features a 20-MPix sensor, presumably the same or a related sensor adopted by other high-end models such as the maker’s DMC-GX8 and the rival Olympus EM-1 Mark II. So it will come as no surprise to learn that it delivers scores that are among the best-in-class for this size sensor. The sensor’s dynamic range is excellent at base ISO, measuring a wide 13 EV, albeit at a low measured ISO of 64 (manufacturer’s ISO 100), and maintains a still-excellent 10.5 EV at measured ISO 927 (manufacturer’s setting ISO 1600). Although the disparity between the measured and the manufacturer’s ISO settings is perhaps a little higher than expected, it’s nothing new and doesn’t stop the sensor from being particularly useful when adjusting the exposure via software, especially for troublesome backlighting. The DC-GH5 also has excellent color discrimination at base at just under 24 bits, and maintains in excess of 20-bits — our quality threshold — at a still relatively impressive measured ISO 465 (manufacturer’s ISO 800). Noise levels are relatively low, matching others in the lineup that use the 20-Mpix sensor. The GH5 sensor measures a signal-to-noise ratio (SNR 18%) of just under 41 dB at base, with good results still achievable — nudging the 32 dB limit at measured ISO 465 ( manufacturer’s ISO 800). From the headline scores it doesn’t look like there’s any real improvement until you realize that the GH5 sensor has a substantial increase in pixel count over the 2014 GH4’s 16-MPix sensor. Both sensors share similar levels of noise, but even then, the GH5 has slightly improved dynamic range and color sensitivity at all ISO settings. At base, the lower native ISO accounts for the increase in dynamic range and color depth scores, but that shouldn’t be ignored. While it’s always the image quality at high ISOs that seems to define sensor performance, the improved color discrimination and latitude for exposure at base ISO, along with the hike in pixel count are no bad things, and will resonate with landscape photographers and videographers alike. 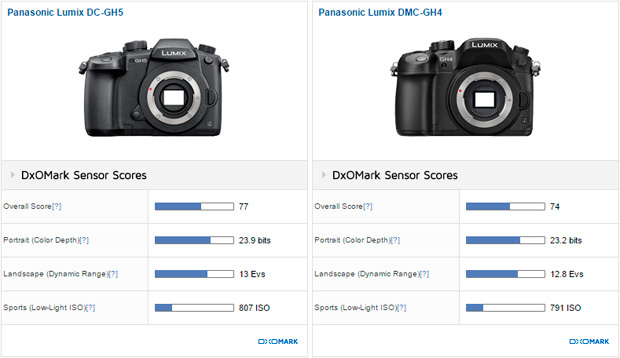 Comparing the image quality results of the Panasonic Lumix DC-GH5 with the high-end Panasonic DMC-GX8 and the Olympus OM-D E-M1 Mark II, we can see that although all three appear to share the same or a similar sensor, the Olympus may have adopted a slightly modified version, or at least tuned it to deliver slightly better results at higher ISOs. In our our Low-light ISO test, it delivered just over a half-stop advantage over the GH5 and GX8, and there’s a similar improvement (if slight in real terms) in dynamic range and color, at least at higher ISOs. The two Panasonic models share identical noise measurements, not just at base ISO, but throughout the range up to their native maximum at ISO 6400. In contrast, the Olympus sensor has still lower noise levels. In our (SNR 18%) noise tests, all three achieved identical noise levels at base despite the disparity in measured ISO values against the maker’s settings, particularly with regard to Olympus. However, while there’s a slight advantage for Panasonic’s rival at lower ISOs, with the EM-1 Mark II leading by just under a half-stop advantage (measured at ISO 160 vs. ISO 117) at the 38dB and the (ISO 688 vs ISO 455) 32dB thresholds, the lead increases slightly at higher ISOs. Lower noise levels allow a wider dynamic range, of course, and that’s what we see here. While the GH5 has a very respectable dynamic range at base of 13 EV falling to around 10 EV at ISO 1600 (manufacturer’s setting, measured at ISO 900), when viewed in chart form, it’s not quite at the level of its main rival, the EM1 Mark II. That said, the GH5 matches (or even slightly exceeds) the Olympus at base. At higher ISOs, the EM1 Mark II has a slightly wider dynamic range, offering the photographer a little more exposure flexibility either with in-camera JPEGs or when processing RAWs. When viewed against the GX8, Panasonic has done well to expand the dynamic range of the GH5, even if it’s not quite at the level of the E-M1 Mark II. While lowering noise leads to a noticeable expanded dynamic range in the results of the EM-1 plotted against the GH5 (and GX8), we can also see a similar increase in color sensitivity for Panasonic’s rival, particularly at higher ISOs. Unsurprisingly, the GH5 largely mimics the GX8 throughout the ISO range, although the GH5 sees some very slight improvement in the lab, mostly at low ISOs, and again at ISO1600 and above. While the sensor in the Panasonic models is an excellent performer, Olympus manages to eke out a little more at higher ISOs. Still, while it’s noticeable in our lab results, it’s unlikely to be noticeable in day-to-day use. All three models perform at the leading edge of current Four-Thirds sensor technology. Like its predecessor the GH4, there’s no doubt the Panasonic GH5 is oriented toward videographers, but there’s still plenty to like about the camera for stills use. In spite of the increase in pixel count to 20-MPix, noise remains at the same level as the earlier 16-Mpix GH4. Even when compared to the maker’s GX8 that uses a similar 20-MPix sensor, the GH5 has slightly improved dynamic range and color sensitivity.